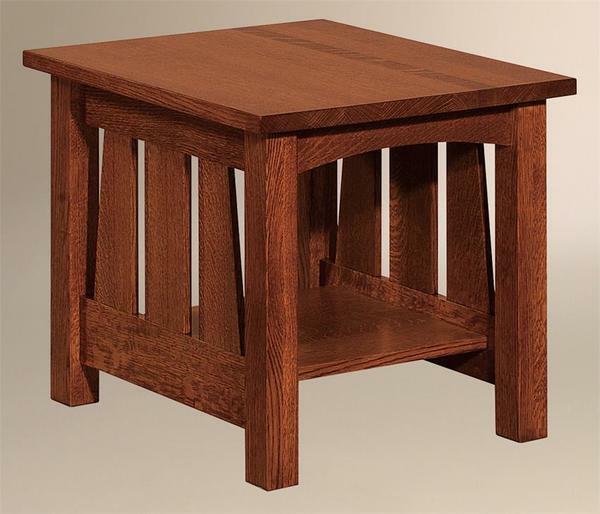 One look at our Amish Elite Mission End Table will have you hooked! Its gorgeous Mission-style slats are carved with care and will make a great accent in your living space. This classic design will act as an anchor whether you choose to make use of it in your living room or bedroom. It will become a focal point, not only providing exceptional beauty but also the function you have been looking for. In the living room, a nice bright lamp looks great on top of this end table with your favorite reading material on its shelf. In your bedroom, a reading lamp and your bedside essentials can be conveniently stored here. You will continue to find uses for your new end table while the integrity will always remain intact. Years of wear and tear will be no match for the quality craftsmanship that the Amish provide. Take a look at the Elite Sofa Table as well as the Elite Coffee Table for more options of this excellent design.